There are many risks to traveling and getting sick is one of them. Malaria is a mosquito-borne infectious disease passed on to humans and animals. All it takes is one bite from an infected mosquito to be infected with this deadly disease. It is estimated that malaria causes approximately 250 million cases of fever and approximately 1 million deaths annually. Malaria is an infectious disease found in tropical areas such as Sub-Saharan, Africa, Central and South America, the Indian subcontinent, South East Asia and the Pacific Islands. Malaria is a very serious disease caused by a bite from a mosquito infected with a parasite called plasmodium. When you are bitten the parasite enters your bloodstream and migrates towards your liver, when they multiply before invading your red blood cells. How do the malaria treatments work? While using mosquito repellent creams are important, the best way to protect yourself from infection when traveling is with malaria tablets. Which treatment you take will depend on where you are travelling. For lower risk areas such as India, a treatment of Paludrine and Avloclor is recommended. 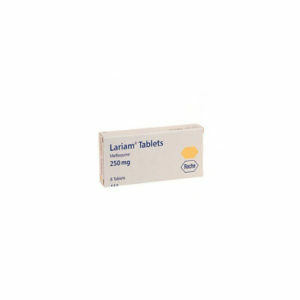 For higher risk areas, Lariam or Malarone is recommended. Chloroquine is another anti-malaria treatment that is effective with 5 strains of malaria. However in some areas may need to be used in conjunction with other medications. These treatments are considered to be the most effective against the most dangerous form of the virus. The malaria parasite is called Plasmodium. There are a few different types of malaria strains that someone can be infected with. These include; Plasmodium falciparum, Plasmodium vivax, Plasmodium ovale, Plasmodium malaria and Falciparum malaria. Malaria infections appear to cause symptoms similar to that of influenza, such as a high fever, headaches or migraines, shivers and muscle pains. Symptoms can appear and then just as quickly disappear. The first symptoms will appear 7-30 days after the infective bite. You should always see a doctor if you feel you have severe flu like symptoms to prevent any long-term damage. 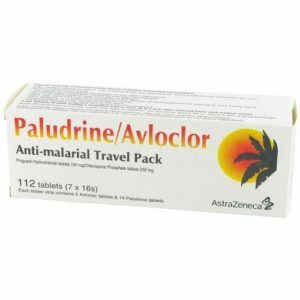 How do I buy malaria medication online? 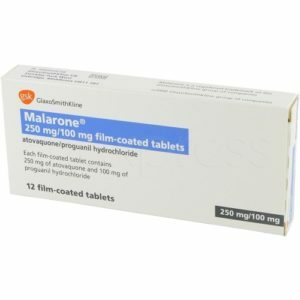 First you need to obtain a valid prescription through an online consultation to purchase prescription medications online for malaria. This is a free and short consultation from the privacy of your home. This replaces the face-to-face consult you would normally have with a doctor. Once you have been approved the medication will be sent out to you as soon as possible.